I got home about noon and found a lovely package waiting for me. I read The Hunger Games about a month or so ago and just today got the next book. 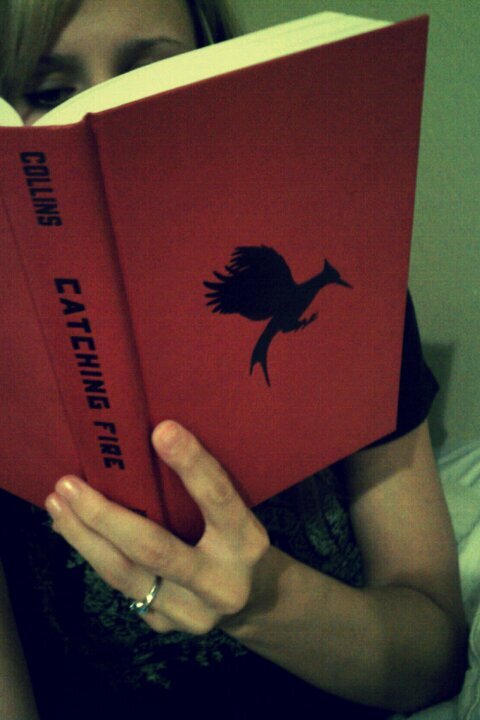 I started Catching Fire about 5pm, took an hour break to play some cards, and just now finished. Holy moly theses books are wonderfully written morsels that everyone should have the opportunity to devour. I wasn't planning on finishing in one day and am bummed that I don't have the next book so I can start it right this second. The first was intriguing, the second captivating and I can only assume that the last book will be just as wonderfully enticing. I cannot wait to read it. Ha, sounds like you were just as obsessed as i was with the series. Enjoy book 2 and 3! Glad I stumbled upon your cute blog! Hey! I found your blog through Casey Wiegand's link-up! I can't wait to ready more! I haven't read any of Hunger Games series but everyone is raving about them. Maybe I'll have to give them a shot before the movie comes out. I am your newest follower. Love the blog. I'm not the one for reading :/ only books I read now a days are for school and half to read them! Have a good one. AH I am reading that too right now, I am so obsessed and cannot put it down! I am glad I found you blog & started following it! It's always fun to find other newlyweds blogs to follow. Look forward to reading more! I think I need to start reading The Hunger Games right now. All three books are sitting on my dresser- i'm still a little confused about why I haven't picked it up!